UPDATE: Battle Ground officials upheld Patriot Prayer’s permit for Sunday’s rally. If you’ve been in Battle Ground the last few weeks, you might’ve seen Joey Gibson, of right-wing group Patriot Prayer, and others marching through the town waiving American and Gadsden flags as well as at least one sign opposing a ballot initiative from last year’s election. Gibson, who grew to prominence by staging rallies in liberal enclaves such as Portland, has in recent months turned his attention to keeping Initiative 1639, a gun control initiative passed last November, from taking root. Although the initiative passed with 60 percent of the vote and much of it has yet to go into effect, it has already run into local resistance. About half of Washington’s 39 county sheriffs have said that they won’t enforce the law. I-1639 passed in Clark County with 54 percent of the vote and Sheriff Chuck Atkins has stated that he will enforce the law. Gibson and other activists have been appearing before local city councils with the goal of convincing each of them to declare themselves a “Second Amendment Sanctuary” that would refuse to support or enforce any law that violates the constitutional right to bear arms. Gibson said he and other opponents of I-1639 have made appearances before every city council in Clark County (with the exceptions of Woodland and Vancouver). “As we go around we kind of feel it out,” said Gibson. He said that he and his group see Battle Ground as having strong potential to pass some sort of measure and has held three marches in the city with another planned for Sunday to drum up support. Gibson said that he’s been in touch with members of city council who said that they are getting many emails and phone calls about the issue. In February, Gibson and other opponents of I-1639 appeared before Washougal City Council asking them to declare the city a Second Amendment sanctuary city. Members of city council seemed receptive and Councilor Brent Boger asked the city attorney to look into it. But the opinion produced by Washougal City Attorney Ken Woodrich stated that such an ordinance would be “legally null and void” and could cause city officials to violate their oaths of office. Gibson said that because of preemption in Washington, a city or county can’t enact their own gun laws. He said that the ordinance his group is promoting will focus more on the Fourth Amendment of the U.S. Constitution, which protects people from unreasonable searches and seizures. Among its provisions, I-1639 expands background checks on sales of semi-automatic rifles and requires safe storage for guns. Proponents have presented the measure as being about gun safety, not confiscation. But the initiative requires the Department of Licensing, working with local and state law enforcement, to develop a process to verify at least once a year that individuals who’ve acquired pistols or semiautomatic assault rifles remain legally eligible. Opponents have raised concerns that this provision could lead to a gun registry and confiscation of firearms. Gibson said that while the ordinance is still being worked out he said it would do two things. It would require any agency from outside Battle Ground, such as the Washington State Patrol, seeking to seize property to notify the city of Battle Ground and its police. He said that the ordinance would also prohibit Battle Ground police from confiscating property, including firearms, without a warrant. “Bob Ferguson can just wash his hands clean if local police are coming in and taking guns,” said Gibson, referring to the state attorney general, who has urged sheriffs and gun dealers to follow the new law. Gibson said he hopes to get all seven members of the council to vote for the ordinance and will recruit opponents for those that vote against it. Battle Ground Mayor Mike Dalesandro said that while the council is listening and has discussed its options with the city manager, no formal action is planned. Gibson is planning on holding another rally in Battle Ground on Sunday in Kiwanis Park. 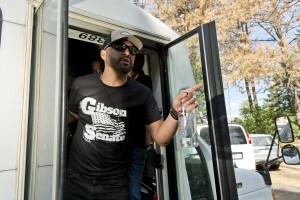 But yesterday Gibson posted documents to Patriot Prayer’s Facebook page showing that the city of Battle Ground received an appeal challenging the group’s permit application for the rally. Erdman confirmed the permit for the special event was issued yesterday and appealed. She said the appeal was signed by “United BG Citizens of the City of Battle Ground” and lists Southwest Washington Communities United for Change as its address. (I have no idea who the first group is but I’ve reached out the second and will update this post if I hear back). Erdman said the appeal challenged the permit on grounds that city code requires permits to be applied for 60 days prior to the event. Gibson said the appeal goes beyond seeking to enforce city code. Gibson said he applied for a permit as a courtesy to the city and that he doesn’t need it because his rally is protected by the First Amendment. He said that Patriot Prayer has spent $2,000 on radio ads (he didn’t recall which stations) all week for the rally and has handed out 200 fliers in Battle Ground. Erdman said that the city has the discretion to allow an event it before the 60-day period is up and that “it’s their First Amendment right to gather.” The appeal will be heard on Thursday and will be decided by Erdman, who declined to comment further.